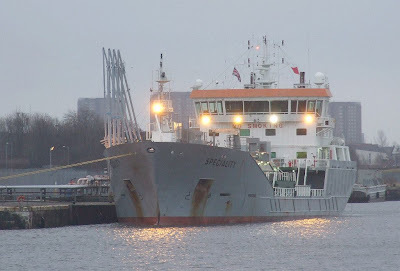 The name ship of James Fisher Everard's four 'Speciality' class tankers is discharging fuel at Rothesay Dock. She anchored in Brodick Bay on Saturday 22nd, and moved up the river on Christmas morning. SPECIALITY was built by the Qingshan Shipyard in China, and was delivered to Everards in May 2006. She has a deadweight of 4,426 tonnes, and an overall length of 95.14 metres. Her crew of eight are mainly British, and she is registered at Nassau in the Bahamas. Propulsion is provided by a sophisticated diesel-electric installation, driving twin screws and giving a service speed of 11.5 knots. Thanks to an impressive array of modern bridge equipment, SPECIALITY and her three sisters have been permitted to sail without paper charts in most European waters.